29-Dec-2014 -- We now almost have a tradition of visiting confluence points during our sailing trips. And of course, those are usually in water. This one is positioned nicely almost half way between the canary islands of Tenerife and La Gomera and it is easy to visit. As a bonus and because it was just a couple of days past Christmas we drove along a way known by children in Germany as "Das ist das Haus vom Nikolaus" (This is the house of Santa Claus) around the spot thus passing the point two times very closely. Remark: I did not do it completely right since we started at the left lower edge and ended there but I had an additional last waypoint lower right so we passed the "street level" three times instead of only once. Well, this was kind of a minor drawback. 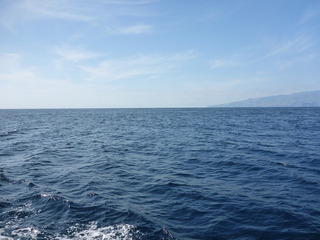 Shortly afterwards when we came a little closer to La Gomera we had been visited by dolphins for quite a while which was funny to watch. Unfortunately we had been a little bit unprepared confluencially this time, so we missed 28°N 16°W on our way from Gran Canaria to Tenerife by 6.5 nautical miles.